The balloons are gone, and so are the cupcakes. Celebrations are long over and I am slowly getting back to normal blogging. Few blog events were missed as I had been under the weather. Let me break the spell with one, or should I say, two-in-one recipes? Before going to the recipes, I have something to share with you. Meeta and The Daily Tiffin have graciously accommodated me into their team. I am excited to be a part of this well-respected team of bloggers and will be contributing monthly. Do check out my first article Vegetarianism – An Introduction. That said, its raining dosas everywhere, thanks to Srivalli who is hosting Dosa mela. I know I am late, but am joining the bandwagon anyway with my ragi dosas, huffing and puffing. Check out the two-part roundup she has done so far. Finger Millet, known as Ragi or Kezhvaragu (Tamil) is highly nutritious and grows easily in less than perfect conditions. Inexpensive, readily available and quite filling, no wonder its called poor man’s food. But don’t let this fool you, because its quite rich in taste. As with any whole grain, it has a signature nutty taste, which works well in both sweet and savoury dishes. Sweet and savoury, that’s how my mom served ‘em. She used to treat us with both versions of dosas made with ragi or wheat flour. I recreated the same meal in an effort to relive my childhood. And it worked like a charm. A ballet on the taste buds with salty and sweet notes. Previously, all my attempts have been less than satisfactory. Either the dosas were leathery or doughy. This time I followed Meenakshi Ammal’s recipes and they hit right on spot. Most of the Indian grocers carry ragi flour. 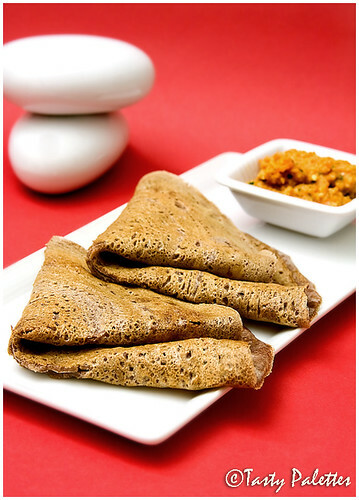 Whole wheat flour can be replaced for ragi flour in both the recipes, to make sweet and savoury wheat dosas (Godhumai dosa). Serves two when served together. Soak urad dal for 2 hours. Refrigerate for 20 minutes and grind to a smooth and fluffy batter. Mix ragi flour, salt and water and make a tight dough. To this, add the ground urad batter and mix thoroughly. If you are making dosas the next day, let this batter ferment for 6 to 8 hours. If using on the same day, mix sour curds to the batter. The final consistency of the batter should be thinner than pancake batter. Heat a griddle over medium-low heat. Wipe it with an oiled paper towel/towel. Pour about 1/3 cup of the batter. Drizzle ½ tsp of oil along the periphery of the dosa. Let it cook for a minute, slowly flip and cook for about 30 seconds on the other side. Wipe the griddle with oiled towel between dosas. Serve while hot with your favourite chutney. Boil 1¼ cup of water. Remove from heat, add jaggery and let it dissolve completely. Mix rest of the ingredients except oil and whisk to a smooth batter without lumps. Over the same griddle on medium-low heat, pour 1/3 cup of the batter. Drizzle ½ tsp of oil along the periphery. Cook for a minute on one side, flip and cook for additional 30 seconds. Wipe the griddle with oiled towel between each dosa. Unlike savoury dosa, the sweet ones are lacey and spongy. Serve hot with a dab of butter. wishes for you to get well soon! whats that in the background of the first pic? looks like bars of white camay soap :) or smooth stones? very pretty! 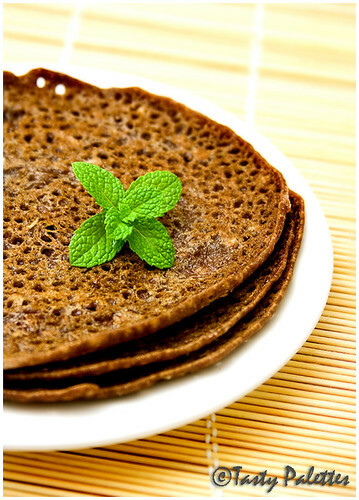 I love ragi dosas, and I didn't even grow up with them, yet, I took to them immediately. Lovely. I love Ragi dosas, this is one of the two ways Ragi is entertained in my kitchen...the other is Ragi balls :) Fab pics Suganya! I think I'd prefer the sweet ones in this case. I have a packet of finger millet and wasn't sure just what I'd use them for. Both variations sound great, but of course I'm drawn to the sweet one... 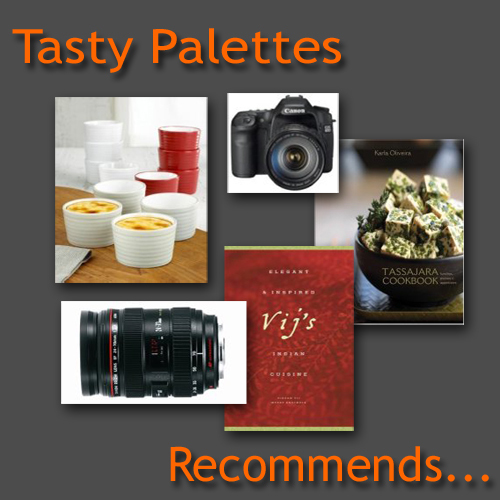 It makes me think of somewhat exotic crepes! Beautiful picture, I had ragi dosa and rotti at my Kannada friends place. It was delicious, though I was lil skeptical to it at first. I should as her the recipe sometime. The texture of those dosas looks really interesting. I like all of the holes in them. I didn't make it in time for Sri's dosa mela, but all these ragi dosas have me really looking for that free morning to try and be late! The second photo is especially lovely, Suganya. The dosas look yum!! Ragi rocks! Yes, there have been a lot of dosa recipes appearing on blogs of late, but honestly, this is one of the most tempting I have come across! I was talking to amma yesterday and she was talking about the ragi sweet adai !!! Just in time ! Thank you for the post,along with photos. These were my fav as a kid. After my granny died,nobody used to make them at home. I was thinking of these and searched the net a lot.Out of all the recipes,this one caught my attention and somehow struck a chord. I made these for breakfast today and boy were they yum even though i skipped the coconut. Planning to try the coconut version for lunch. Yum! Thanks again from the bottom of my heart. Feel like a kid again,sitting beside my granny and munching them.